Currently copying an integer field value over to another item is not a straightforward process, but it is possible through the use of a Calculated Field. A Calculated Field is an integer field on an item that allows for calculating sum, multiplication, and average. You can read up on calculated fields here. Next, navigate to the item type that you will copy the integer field from. In my example, this is the Calculated Field Requirement (CFR). Select Config. Add a custom integer field by selecting Add Field and Save your changes. I named this integer field Rank. Do the same for the other item type, Calculated Field Business Requirement (CFRB), but instead select Calculated. I am using Sum as the Calculation Type, as there will be no other items in my example to calculate a sum from. It will simply add 0, therefore not changing the Rank. Select the Calculation Source to come from Related Item(s) and select the Item Type that it will inherit from, iCalculated Field Requirement (CFR). Select the field you would like to inherit from. This will be the integer field Rank from the Calculated Field Requirement (CFR). 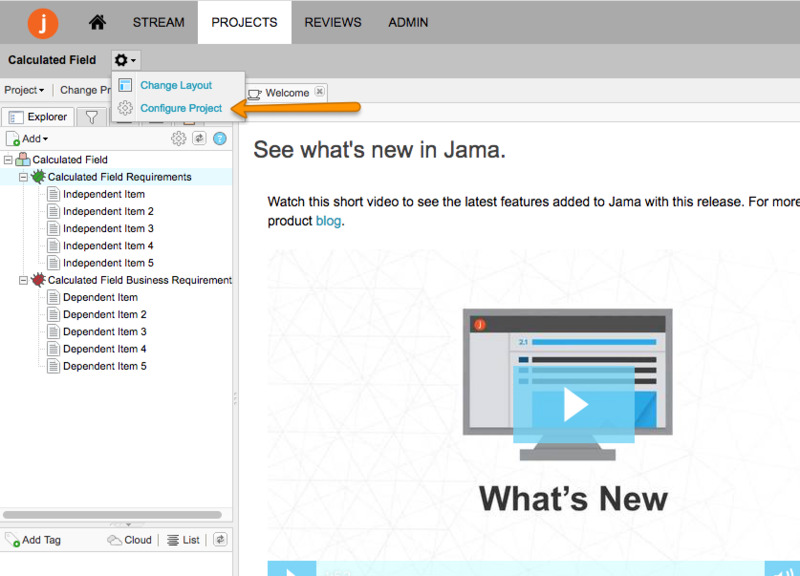 Edit the other fields to reflect your needs and Save your changes. Next, create a relationship. On the left menu bar, select Relationships and create a relationship between the two item types. Now to the fun part. Head over to the Project you will be working in. 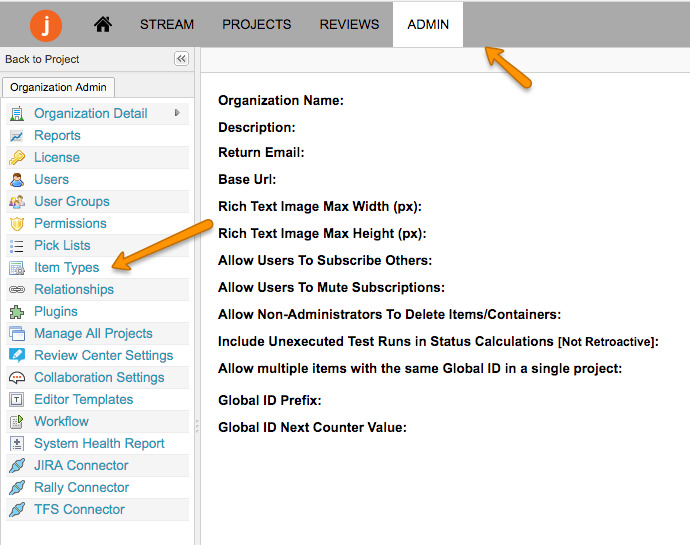 If you created item types, be sure to configure your project to include them in Visible Item Types. 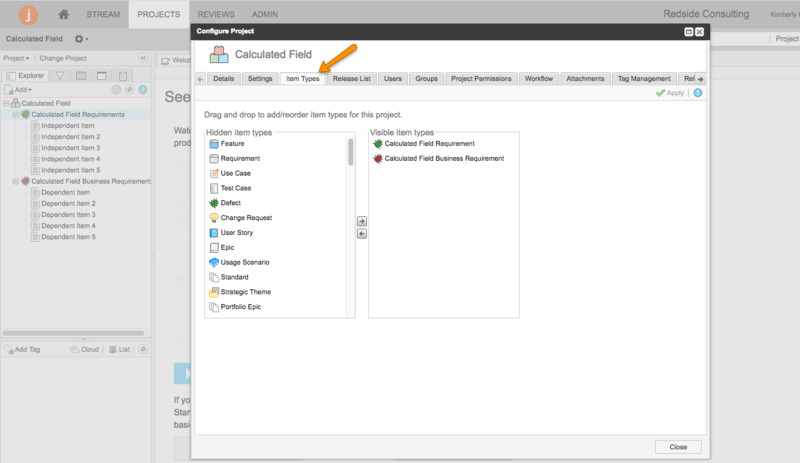 Create or edit the item with the integer field, a Calculated Field Requirement (CFR). 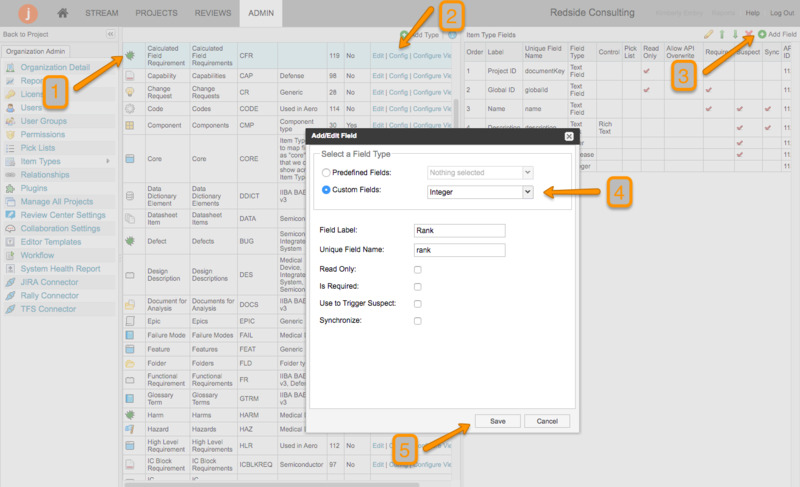 Next, create or edit the item with the calculated field, a Calculated Field Business Requirement. Click on the Relationship Widget, and create a relationship between the two items to watch the magic happen. Editing the CFR item's integer field should automatically populate on the CFRB item. Sometimes this change can take awhile to be visible. To expedite, open and close the edit window to see that change take immediate affect.